8020 Admin posted a press release Argo Gold Drills 34.4 g/t Gold and 7.4 g/t Gold Both Over 0.5m at Its Woco Gold Project in Argo Gold Inc.
8020 Admin posted a press release Argo Gold Drills 132 g/t Gold Over 1.8 m At Its Flagship Woco Gold Project in Argo Gold Inc.
8020 Admin posted a press release Argo Gold to Exhibit At PDAC, Investors Exchange - Booth #3300 in Argo Gold Inc.
Toronto, Ontario--(Newsfile Corp. - February 28, 2019) - Argo Gold (CSE: ARQ) (the "Company" or "Argo Gold") is pleased to announce the Company will be an exhibitor at the Prospectors and Developers Association of Canada (PDAC) Conference in Toronto, from March 3rd to March 6th, in the Investors Exchange - Booth #3300 (right behind the core shack). The Company is excited that it will have on display some recently drilled core, from the ongoing diamond drill campaign at their flagship Woco Gold Project in the Red Lake area of Ontario. This drill campaign represents the first follow-up drilling in over 25 years at Woco; the Company is pleased the program is on schedule with approximately 50% of the original planned meterage being completed. Argo Gold has been selected as one of the companies to represent Ontario at the Canada-China Mining Trade and Investment Forum 2019 which takes place on Tuesday March 5th at the Intercontinental Hotel, Ballroom B (225 Front Street West, Toronto, Ontario). Argo Gold will be presenting at 10:05 AM EST. 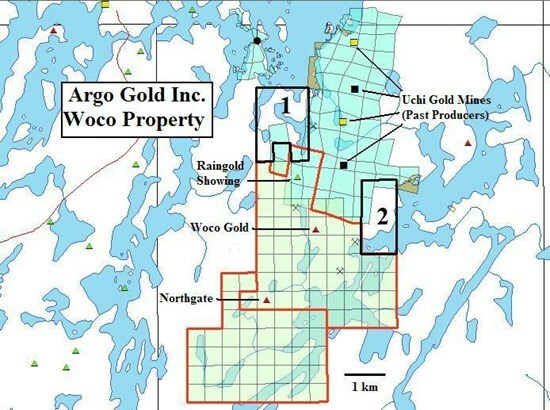 8020 Admin posted a press release Argo Gold Initiates Drilling On Its Woco Gold Project in Argo Gold Inc.
8020 Admin posted a press release Argo Gold Expands Flagship Woco Gold Project in Northwestern Ontario in Argo Gold Inc.
8020 Admin posted a press release Argo Gold Announces Shares for Debt Settlement in Argo Gold Inc.
8020 Admin posted a press release Argo Gold to Begin Drilling at the Woco Gold Project in the Red Lake District, Northwestern Ontario in Argo Gold Inc.
8020 Admin posted a press release Argo Gold Announces Third Closing of Flow-Through Shares in Argo Gold Inc.
8020 Admin posted a press release Argo Gold Announces Second Closing of Units and Flow-Through Shares in Argo Gold Inc.
Toronto, Ontario--(Newsfile Corp. - December 24, 2018) - Argo Gold Inc. (CSE: ARQ) ("Argo Gold" or the "Company") is pleased to announce that on December 21, 2018 it completed the second tranche ("Second Tranche") of its previously announced non-brokered private placement offering through the issuance of 125,555 units ("Units") at a price of $0.18 per Unit and 1,023,000 flow through shares ("Flow Through Shares") at a price of $0.22 per Flow Through Share, for aggregate proceeds of $247,660, of which a significant portion came through Topleft Securities Ltd. Each Unit consists of one common share (a "Common Share") of the Company and one-half of one common share purchase warrant (each whole warrant, a "Warrant") with each Warrant entitling the holder thereof to purchase one Common Share at an exercise price of $0.25 for a period of twelve (12) months from the date of closing of the Second Tranche. In connection with the issuance of the Units and Flow-Through Shares subscribed for in the Second Tranche, the Company paid a finder's fee equal to $18,407.20 and issued an aggregate of 84,560 broker warrants (the "Broker Warrants"), including to Topleft Securities Ltd. Each Broker Warrant is exercisable into one Common Share at a price of $0.25 per share for twelve (12) months from the date of closing of the Second Tranche. The securities issued in connection with the Second Tranche are subject to a hold period of four months and a day from the date of closing of the Second Tranche. 8020 Admin posted a press release Argo Gold Announces Offering of Units and Flow-Through Shares in Argo Gold Inc.
Media Relations has joined Argo Gold Inc.
Luc St-Pierre has joined Argo Gold Inc.
DArcy Funfer has joined Argo Gold Inc.
8020 Admin has joined Argo Gold Inc.